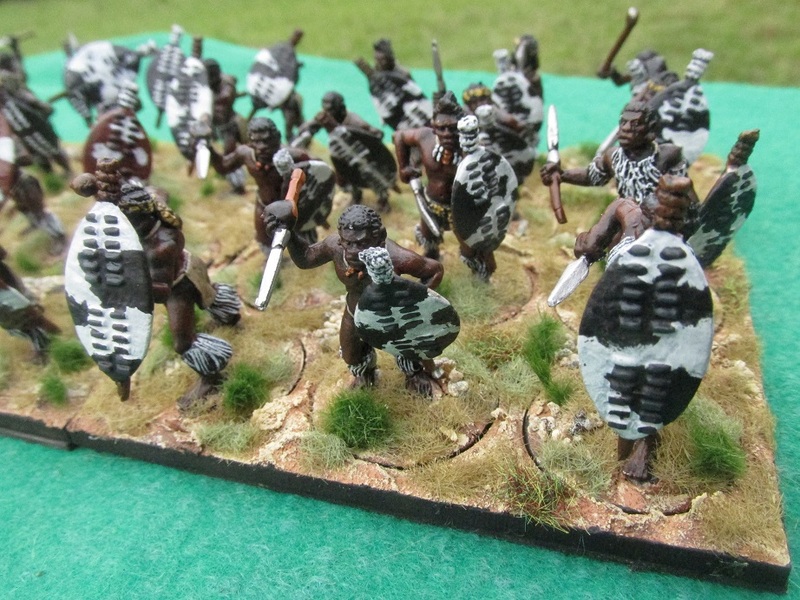 Yet more Zulus – some command bases. 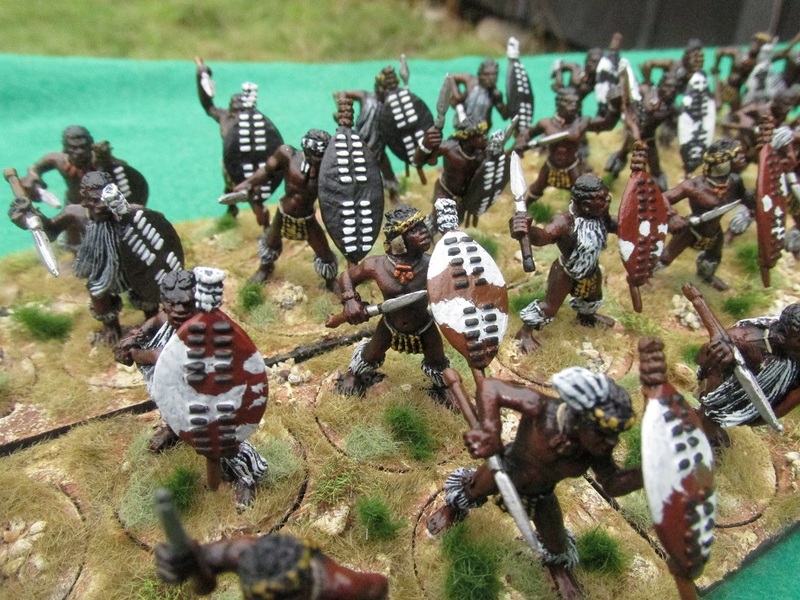 We all know you can never have enough Zulu warriors. That being said, that also means you can never have enough command elements to lead them. 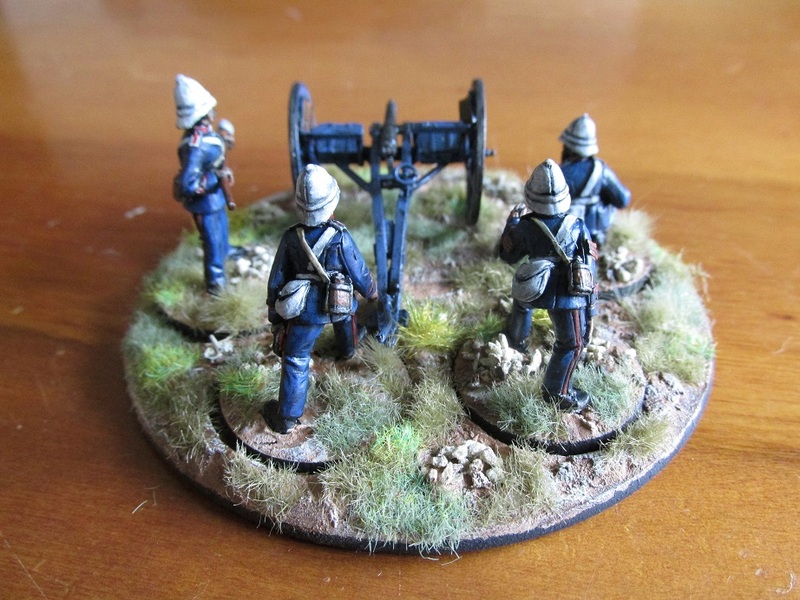 These were the last of the figures I finished off in my painting marathon before Easter. Black Tree Designs from some of the command sets. 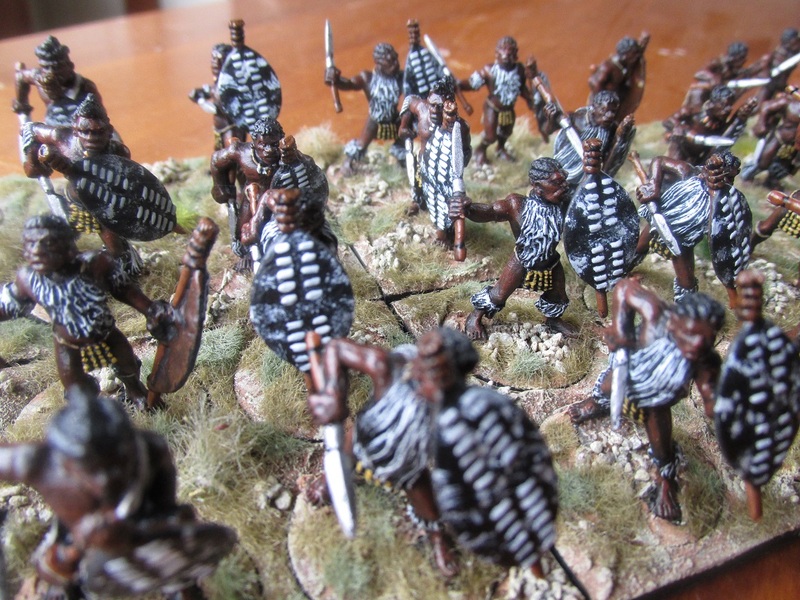 More Zulu Command can be seen here in this older post. 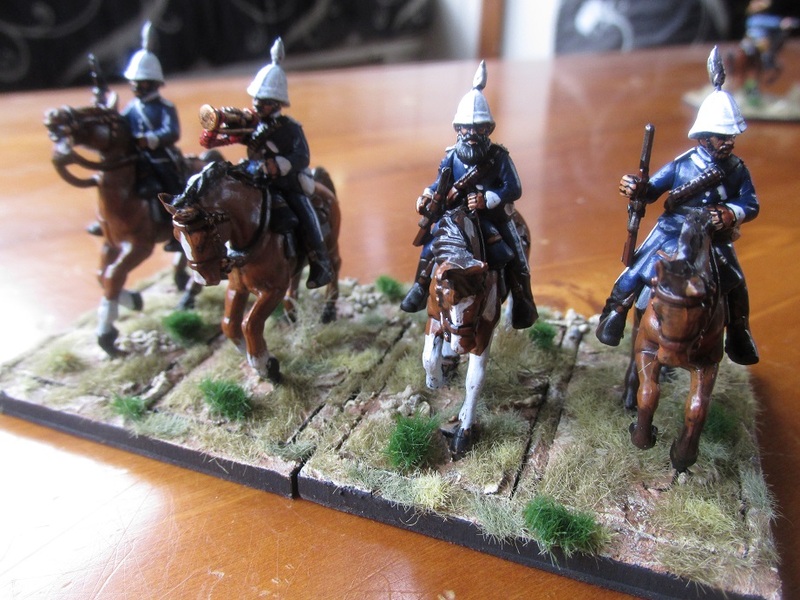 Over Easter I had friends coming up to stay at the Woolshed and I wanted to host a Zulu War game. 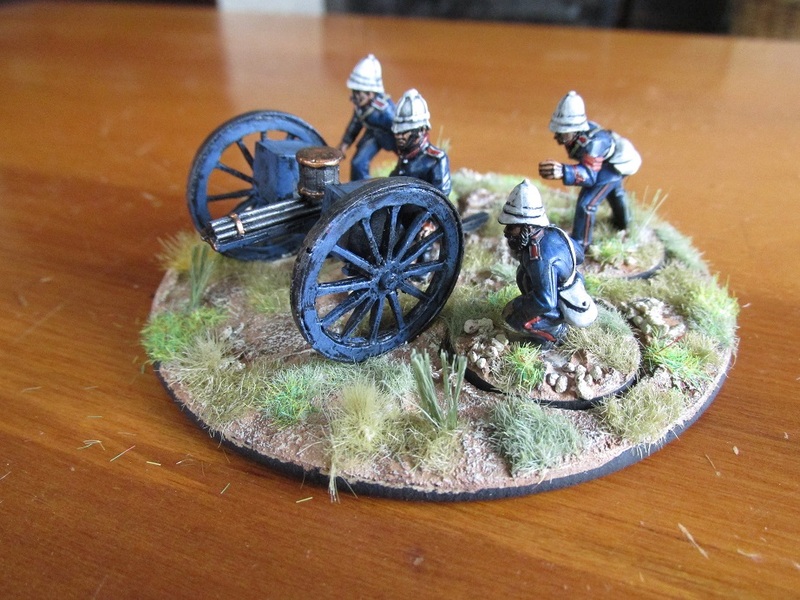 I had already painted two more Zulu regiments this month and wanted to knock off a third. This regiment of thirty-six figures took me two days. 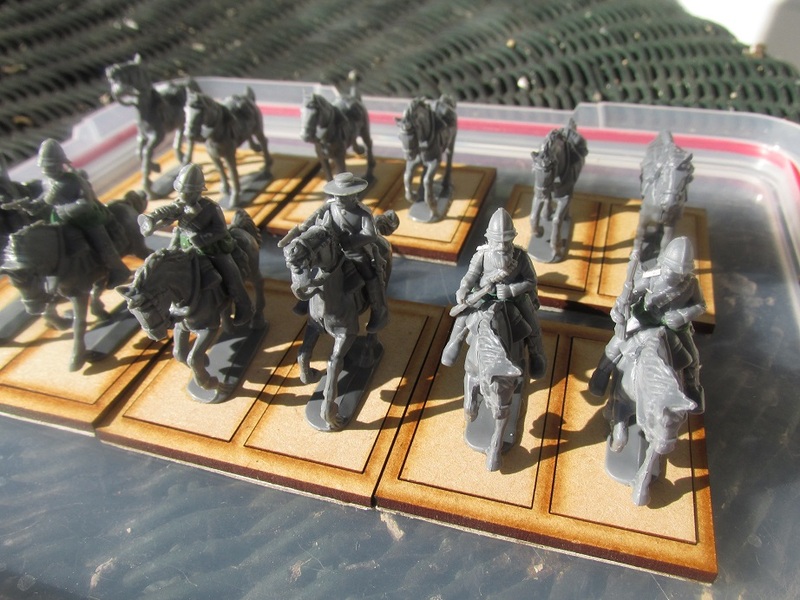 I had got them assembled and undercoated black on the weekend before Easter. 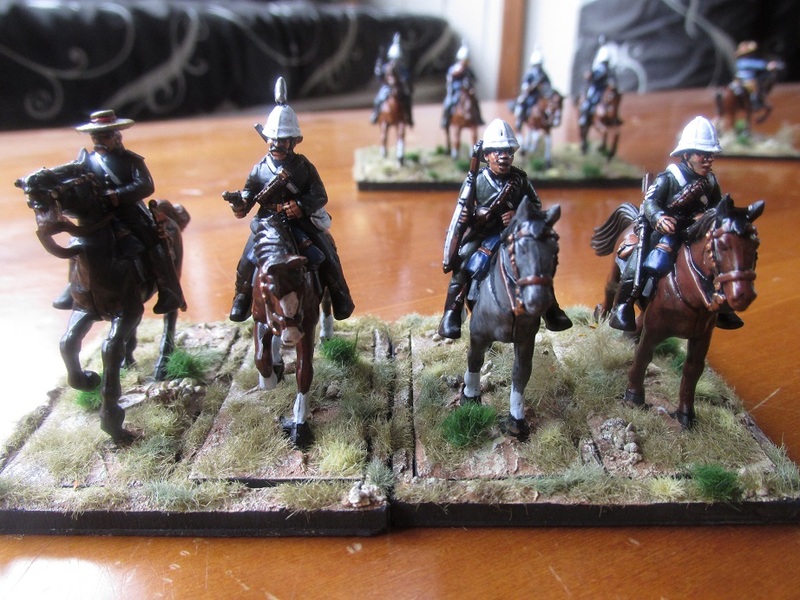 Started them on Tuesday and finished them Wednesday evening – based and ready to go. One of the youngest regiments in action during the war. uVe were formed in 1875. At Isandlwana they were in the left horn that was engaged by Durnford’s cavalry and were part of the group that rolled up the British line. Farnsworth says that they may have been equipped with smaller umBumuluzo training shields rather than full sized war shield. I don’t have any shields that small so my uVe have full sized ones. 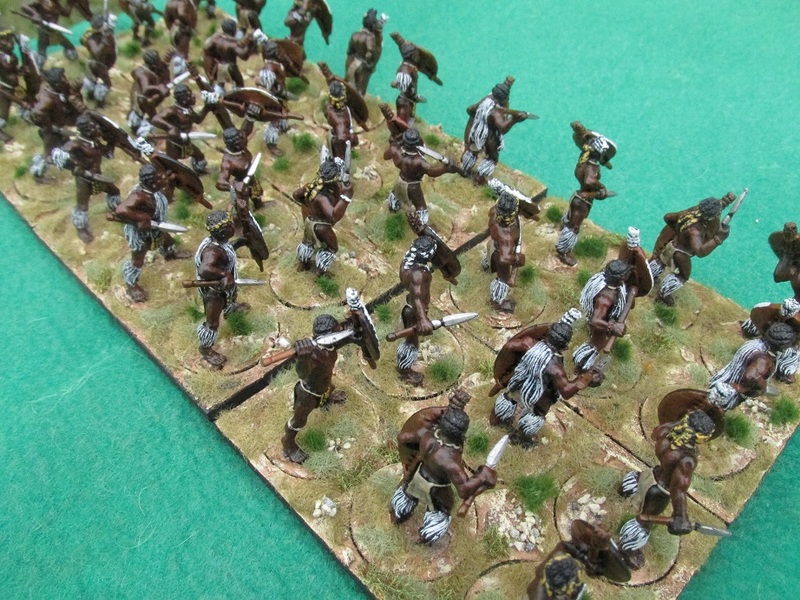 I do like the mixed shields in this unit. Once again these are Black Tree Designs. 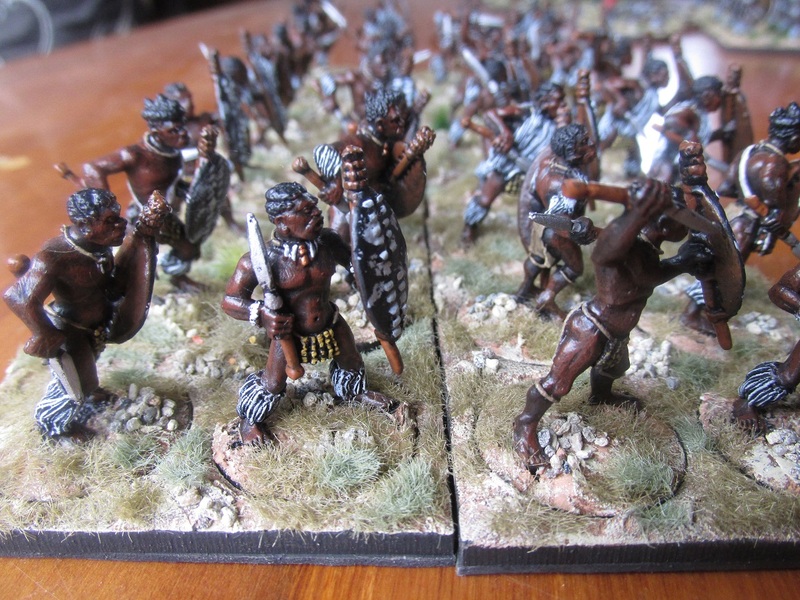 I have one solitary married regiment left to paint, and that will leave me with ten completed Zulu Regiments. I guess I will wait until BTD has another sale or I find more second hand. 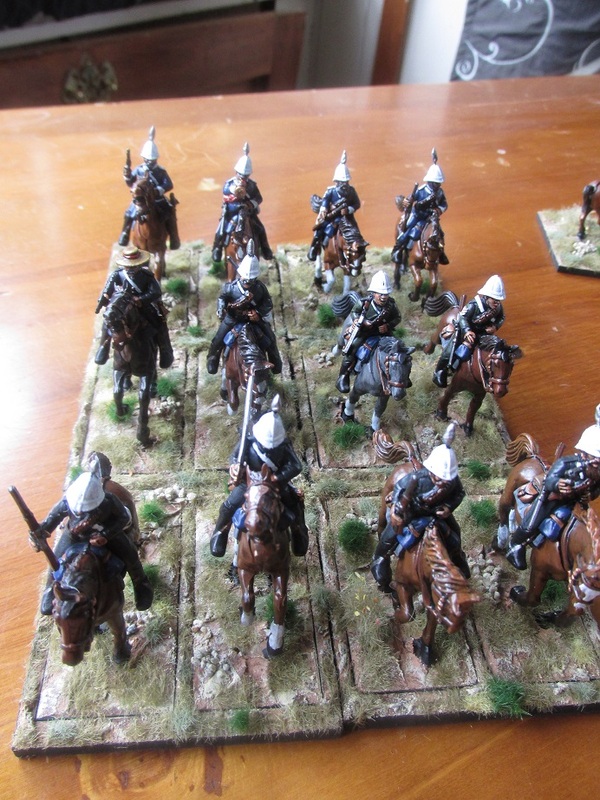 My Napoleonic armies tend towards being represented as wearing campaign dress. I like the somewhat ragged look and non-uniform uniform look if you will. But I do have a few units in Full Dress. 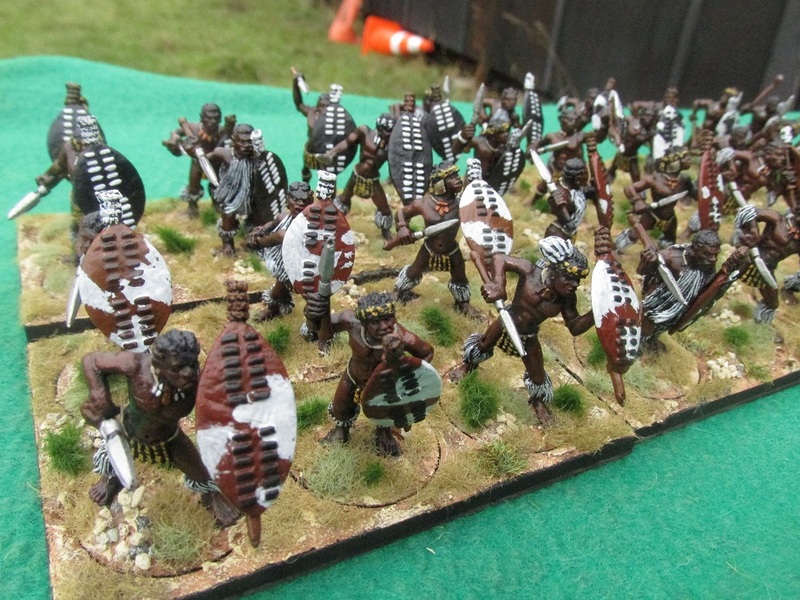 Same goes for my Zulu Army. I had to have at least one unit wearing parade dress, if for no other reason than they were on sale at 50% off! 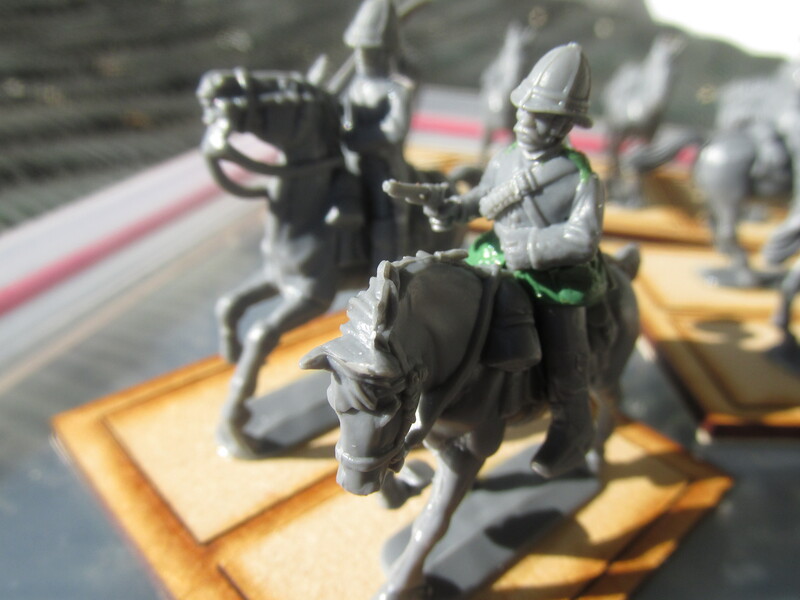 Black Tree Design have a couple of sets of troops representing the uThulwana Regiment. The eight figure poses give enough variety even in a large thirty-six figure unit as I have used them for. These figures could easily be used for any senior regiment in parade dress. 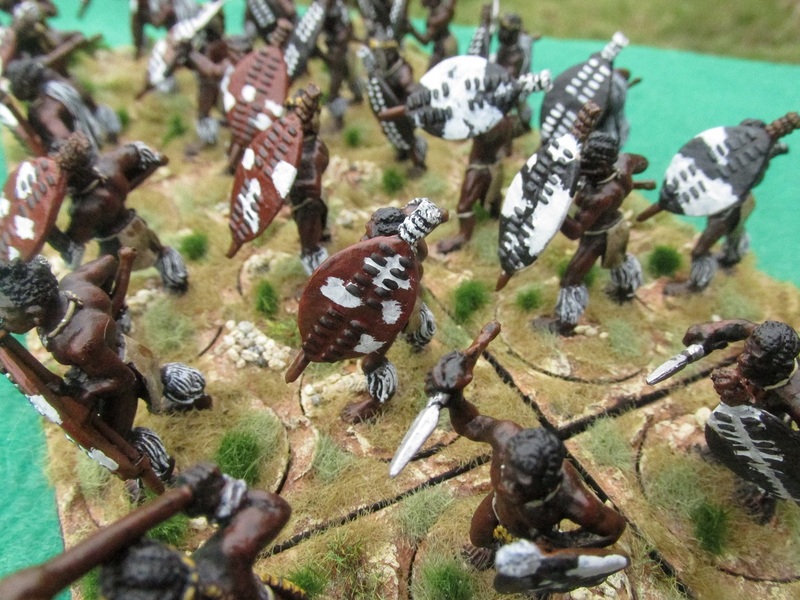 uThulwana were in the reserve at Isandlwana and for the most part saw no action in that battle. It later took part in the unsuccessful attack on Rorke’s Drift. uThulwana was raised in 1850, it’s ranks filled with mature married men in their middle age. The regiment boasted some famous former recruits, with both Prince Cetshwayo and his brother Prince Mbuyazi having served in it’s ranks before they fought a civil war to decide who took the throne. I am guessing that Prince Mbuyazi’s name wasn’t mentioned too many times at regimental dinners and reunions after 1856. Various sources have uThulwana shields as white with some small red patches. 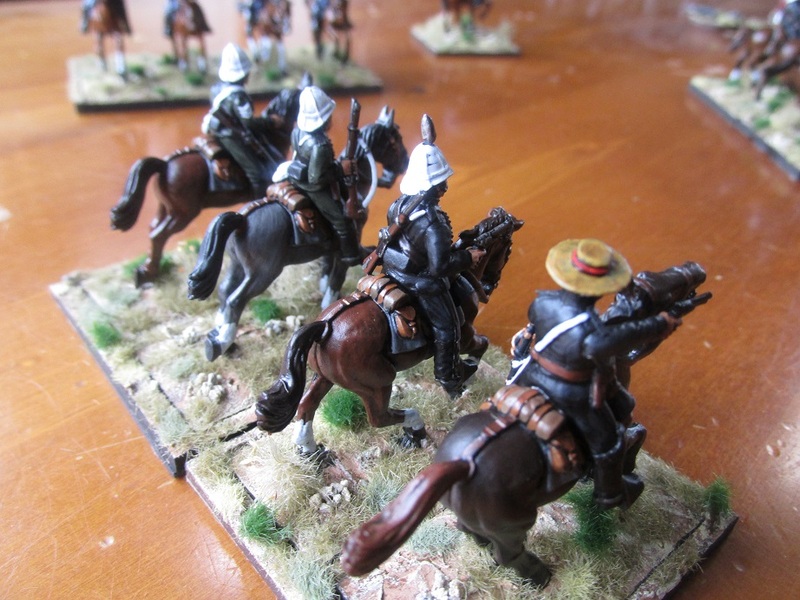 I have wanted to include a unit of Volunteer and Auxiliary Cavalry in my British force for some time but various reasons – mainly cost and other spending priorities, has put this on the back burner. 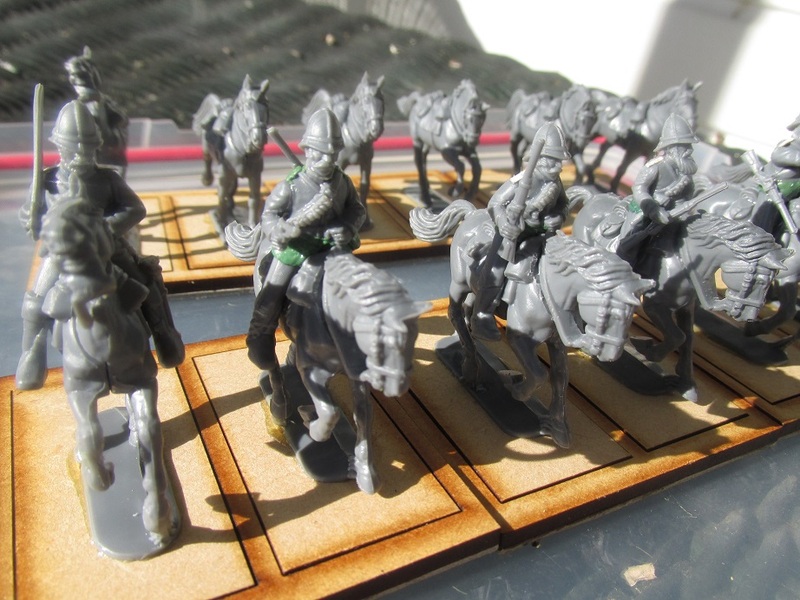 However, I splashed out and ordered some Empress dismounted volunteer and auxiliary cavalry from Nathan at Elite Miniatures Australia. While waiting for them to arrive I decided that of course that meant that I needed to represent these guys in their mounted form as well. So…I decided to give converting a go. 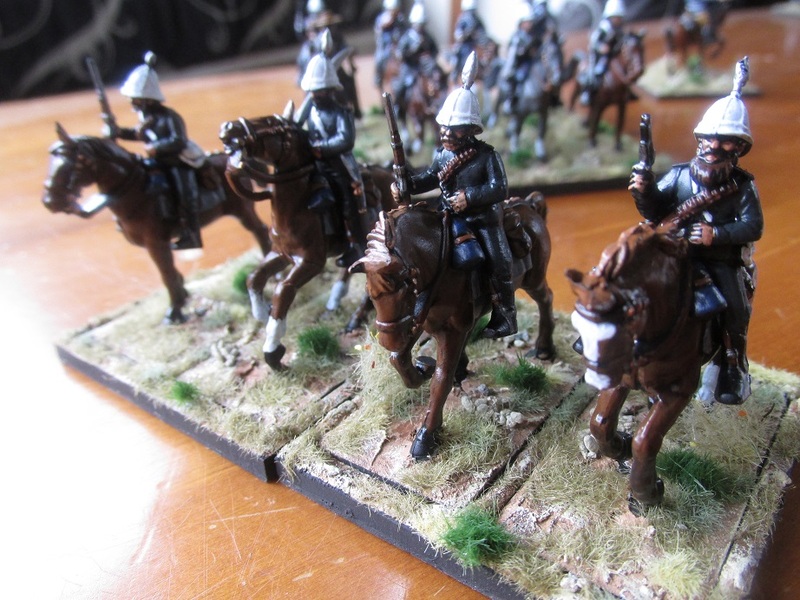 I looked through the lead/plastic mountain and found a box of Perry ACW Cavalry. 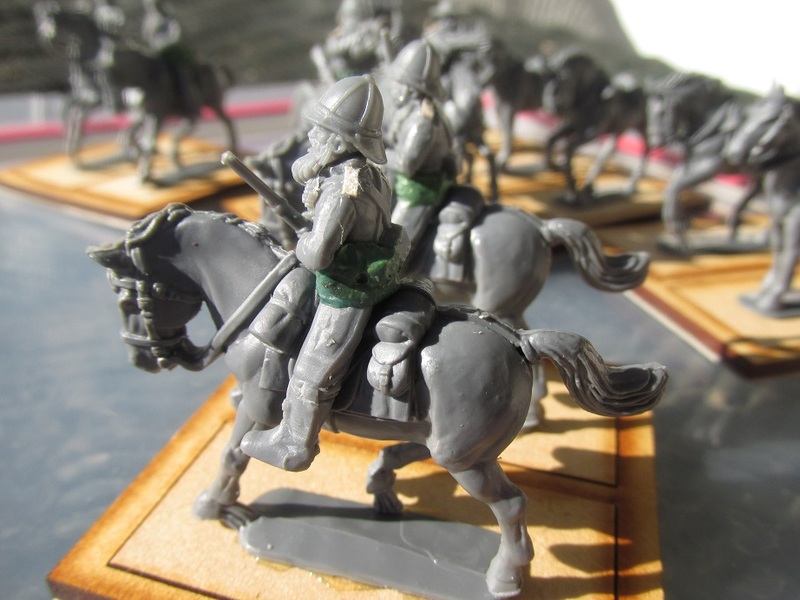 I also had sprues of Warlord Games British infantry and Natal Native Contingent available, along with a tube of really old greenstuff. These guys came out a bit huckery in places but on the whole I was happy enough with the outcome considering it was a two day job. 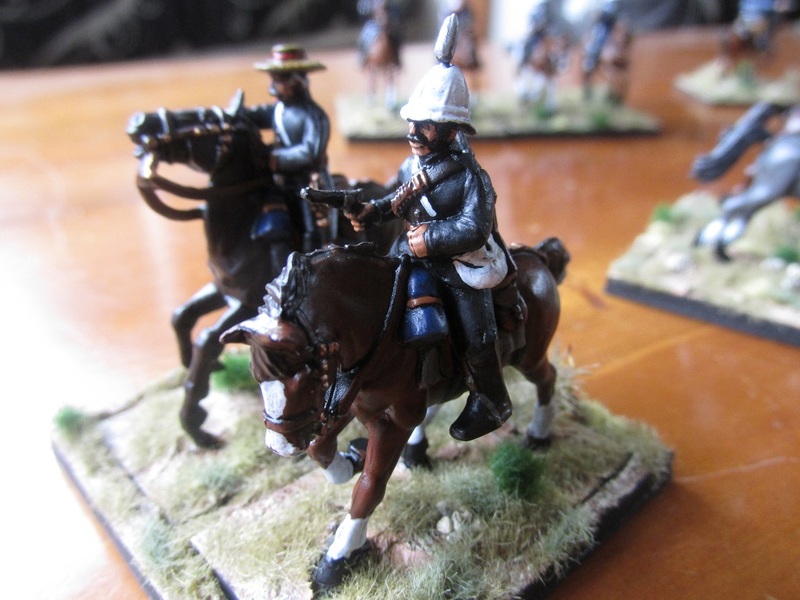 I made four Natal Mounted Police, four Natal Carbineers, two Newcastgle Mounted Riflemen and two Buffalo Border Guard. The horses were used as is. 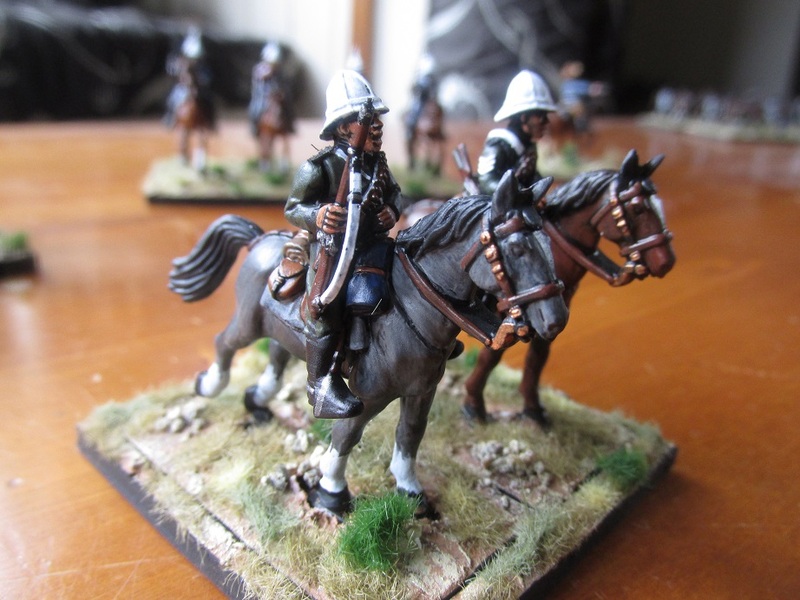 The tack and harness is not exactly Zulu Wars Imperial but I could live with that. 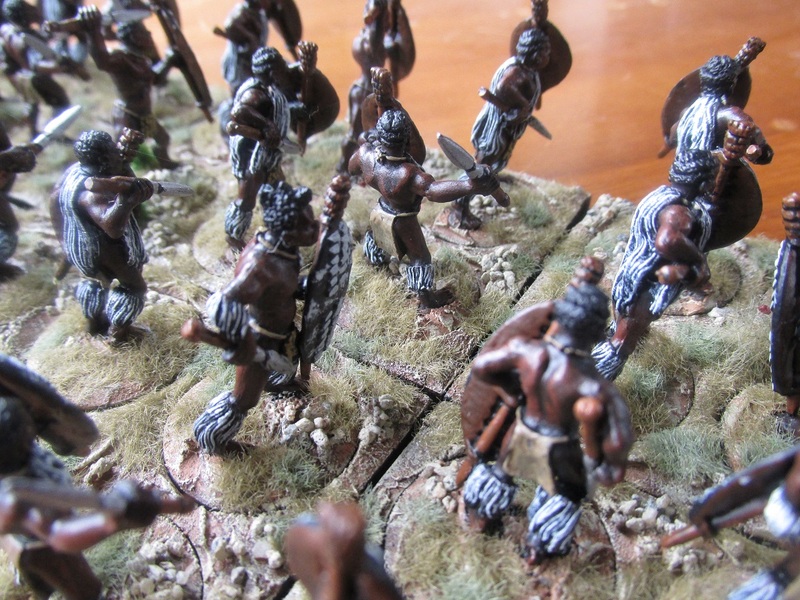 Bodies were mostly used as is, with some tunic lengthening and ration bags added with greenstuff. 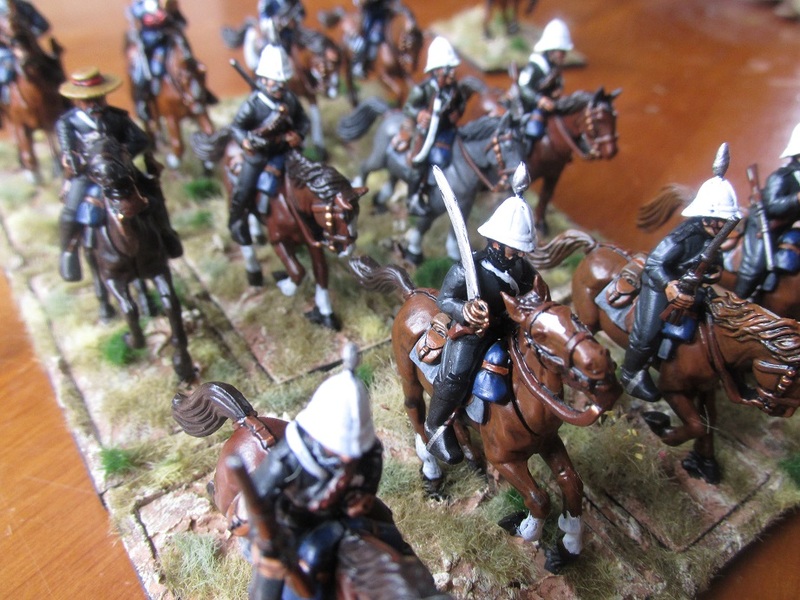 Helmets and hats came from Warlord Zulu Wars British infantry and cartridge belts from their plastic Natal Native Contingent sprue. I also took the odd NNC hand and rifle as well. 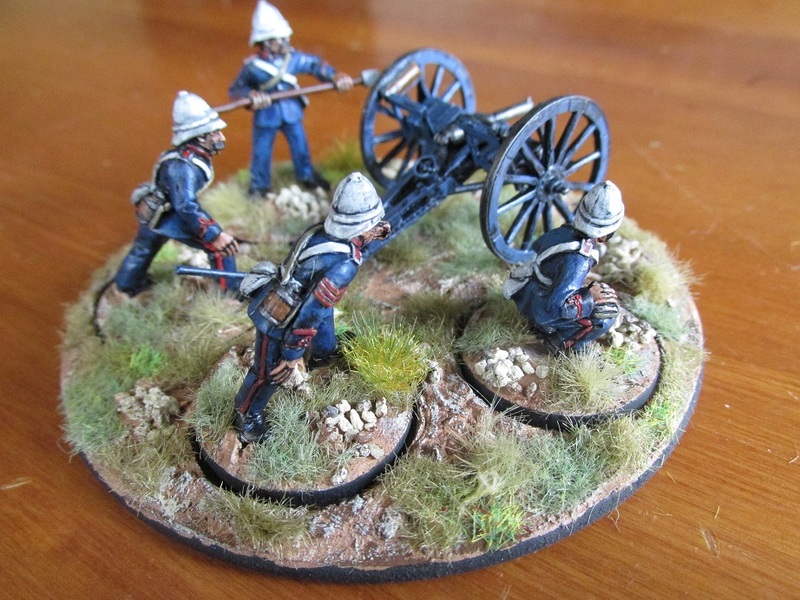 Not the greatest conversions but I think will pass muster on the tabletop and three feet of distance. Left – Buffalo Border Guard – Right – Newcastle Mounted Rifles. 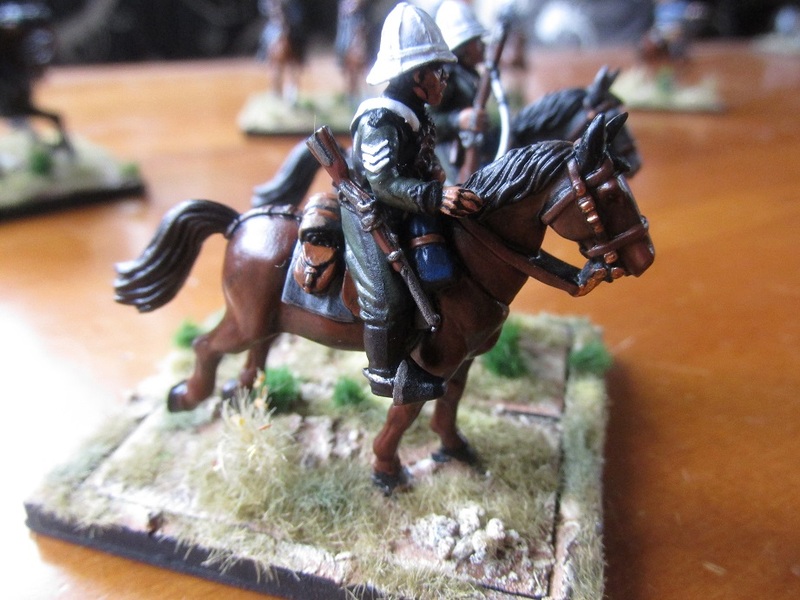 And a Redoubt Miniatures Col. Durnford to lead them. 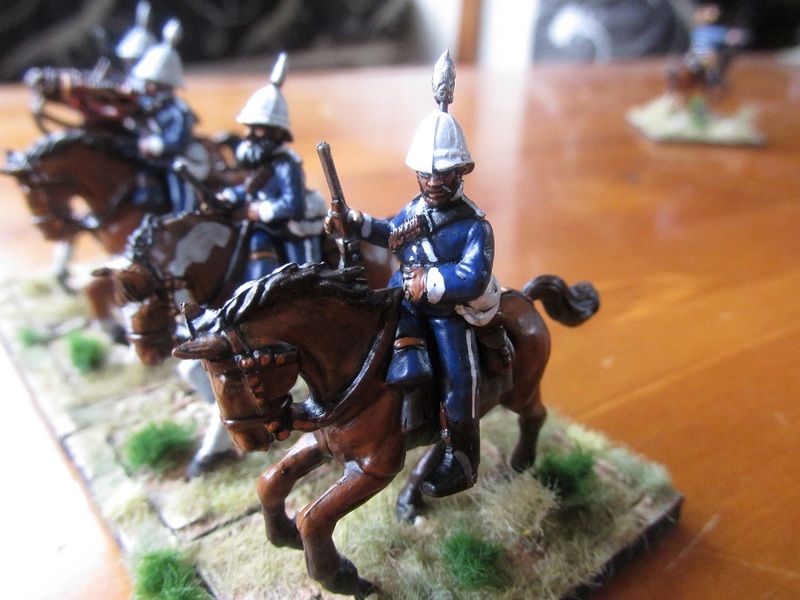 I couldn’t remember what colour his uniform in the movie Zulu Dawn was so just went with the blue-grey tunic. Might get another Durnford at some stage and paint up as Burt Lancaster. After a year of very limited painting I am slowly getting back into the groove. 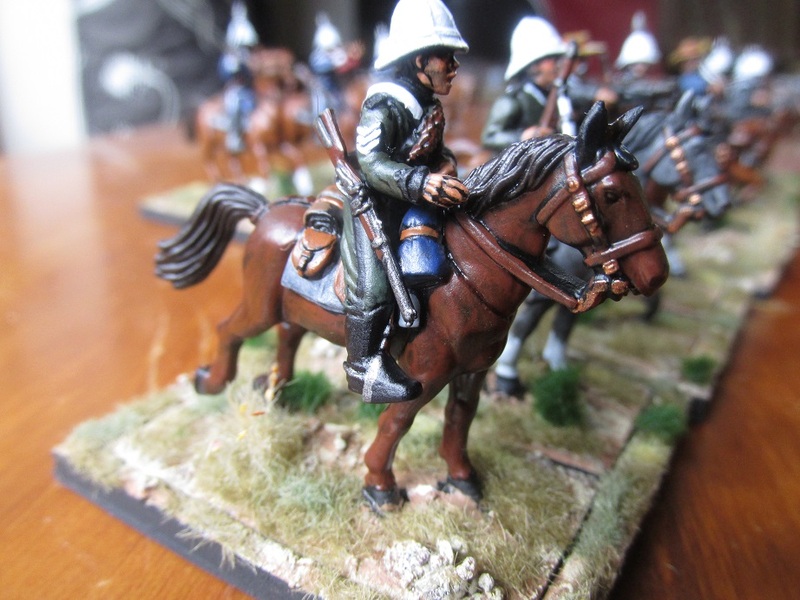 Last two weeks I have completed three units (two Zulu and one British – well four British if you count the sub units). 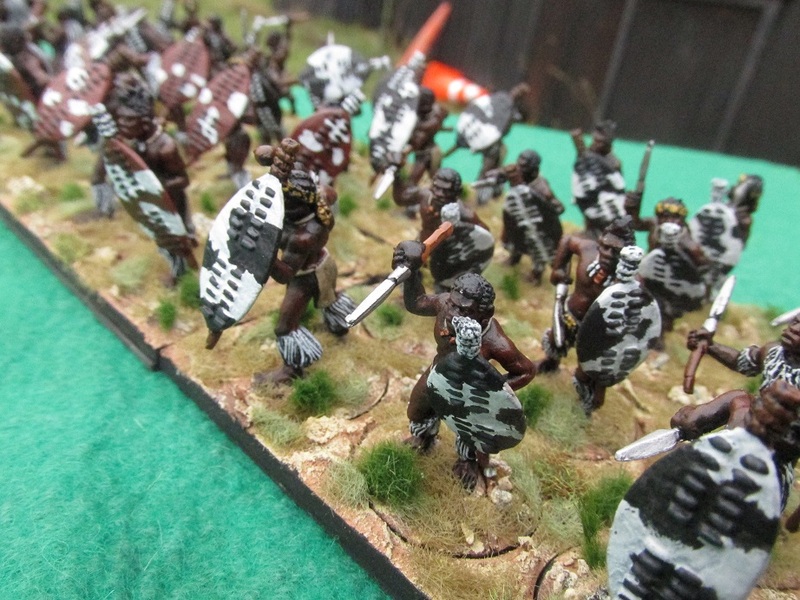 Today I am posting another Unmarried Zulu Regiment. This is uMbonambi “The Evil Omen”. It was re-constituted in 1863. It was originally formed in 1821 during the reign of Shaka. 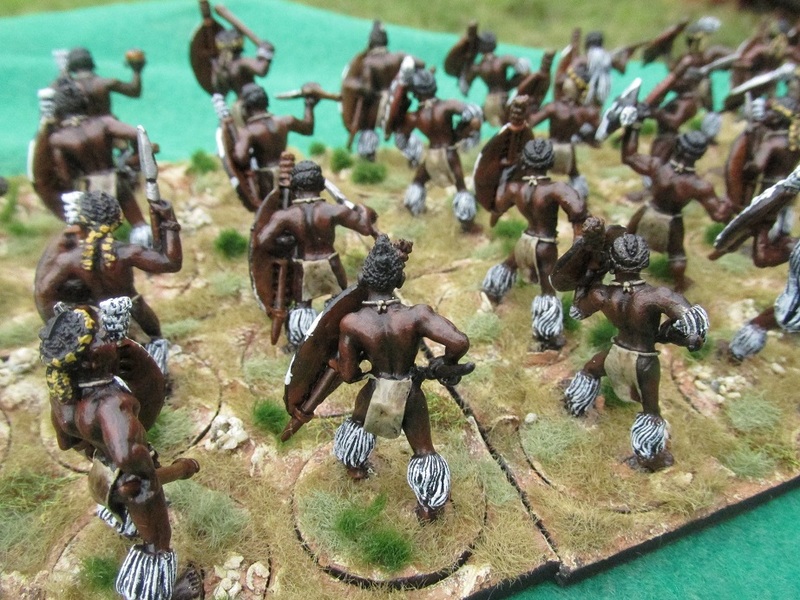 At the time of Isandlwana the majority of it’s men would have been in their mid thirties (35-37). 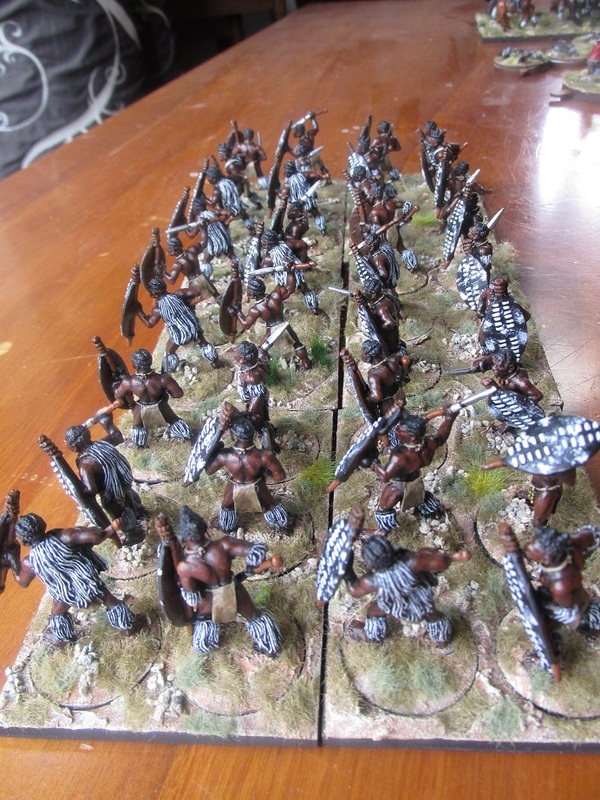 The regiment was present at many other battles in the Anglo-Zulu War and by the time of Ulundi may well have been reinforced with younger replacements but I seriously doubt that would have effected their fighting ability. 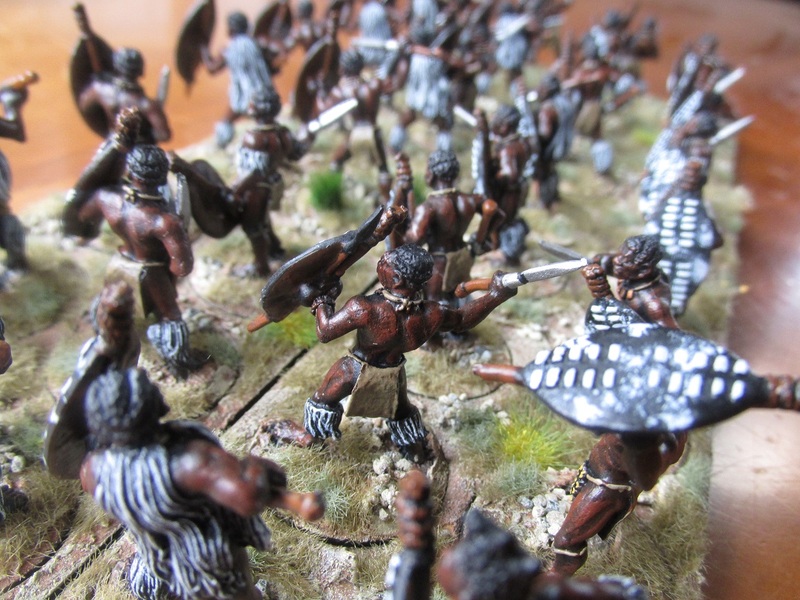 At Isandlwana they formed part of the Zulu Left Horn that initially engaged Col Durnford and finally swept into the British camp from the south after overrunning the right flank companies of the British line. Figures are all Black Tree Designs. Bases are 25mm rounds inset into 90x60mm rectangular bases. 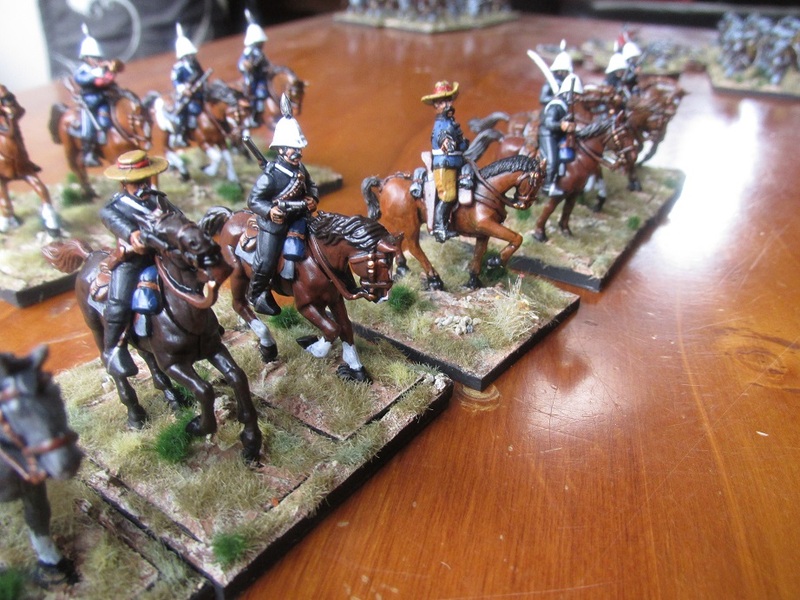 I have one more Unmarried Regiment to complete to finish the Left Horn forces. 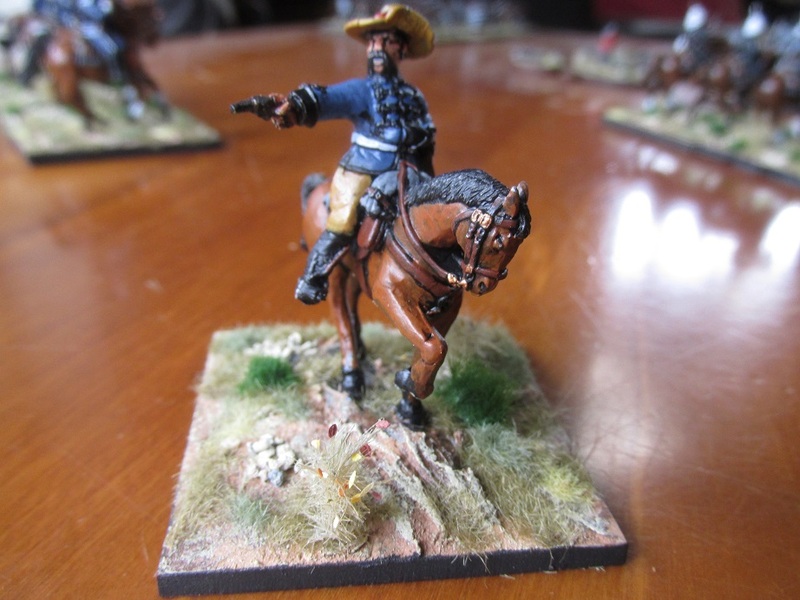 I have gone for these big thirty six figure units for no other reason than they look cool. Like I needed another period to paint. 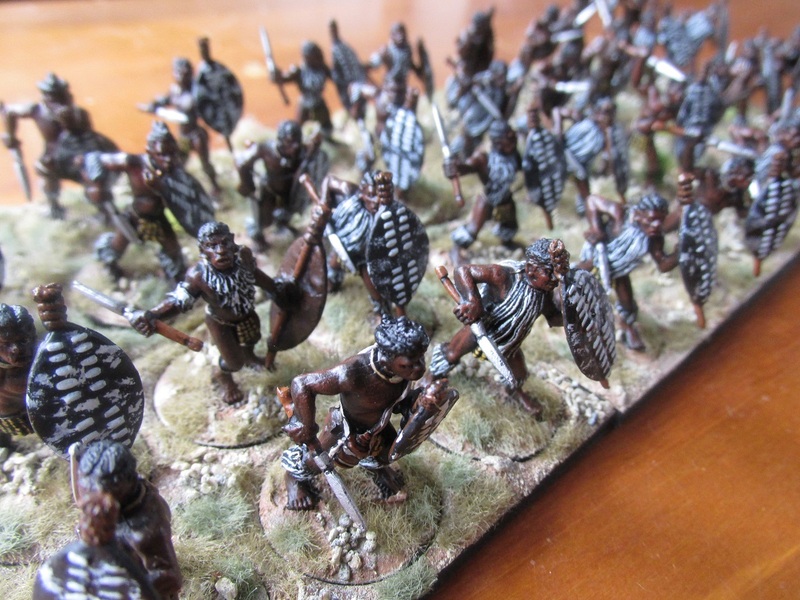 I saw a collection of Zulu Wars figures on Trademe (New Zealand’s own eBay type site) and they were what I considered a bargain. To top it off I had just watched Zulu again…and…and….I am an addict. There! I said it! These minis are like meth to me. 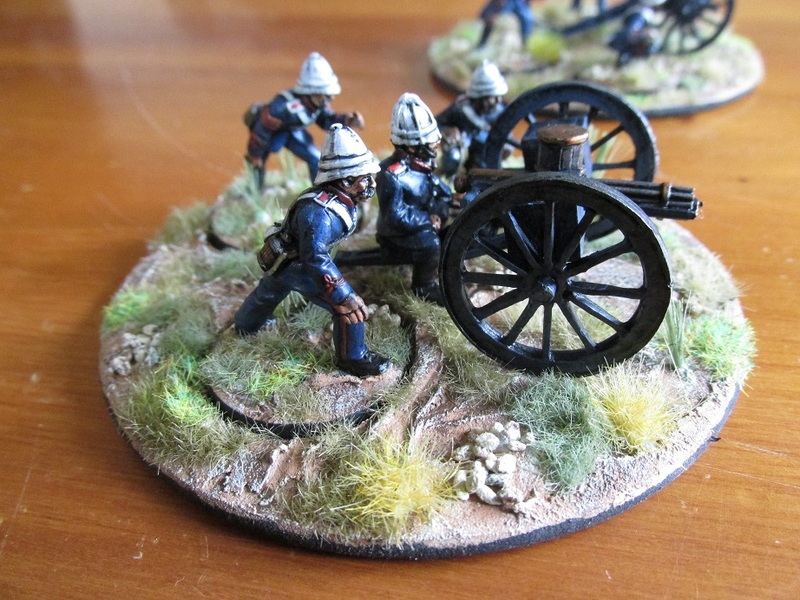 I got 40 British Infantry, 30 Boers, 30 Natal Native Infantry, 9 British Lancers and these two artillery pieces with crews. There were also 120 Zulus. All metal and less than NZ0.80c a figure (not counting the guns and horses). 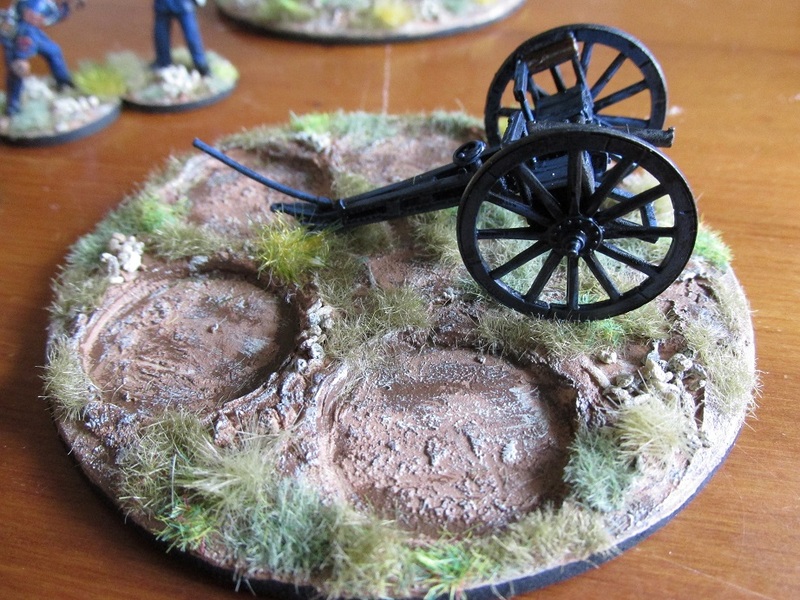 All the British/Allies were already based onto 25mm MDF rounds. 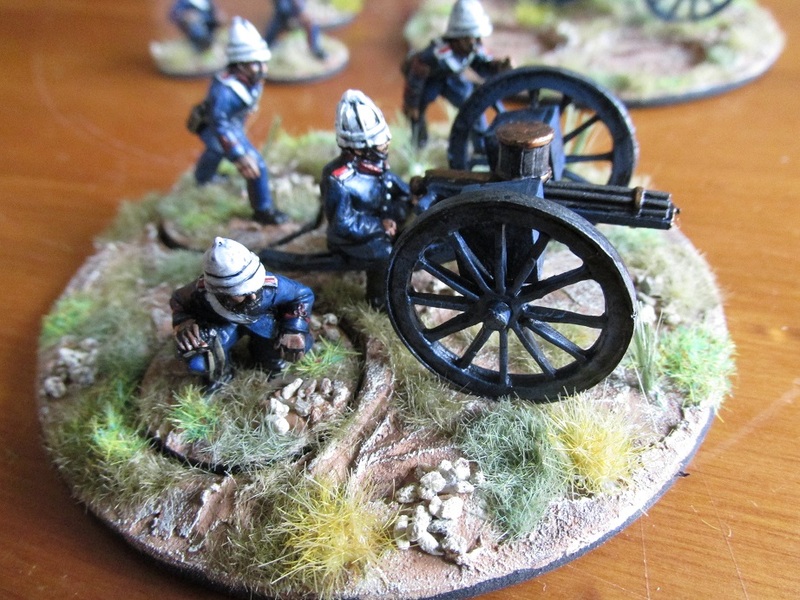 I decided to leave them like this and use sabot bases for them. First off a Black Tree Gatling Gun. There are an additional three Empress Miniatures crew serving this weapon. 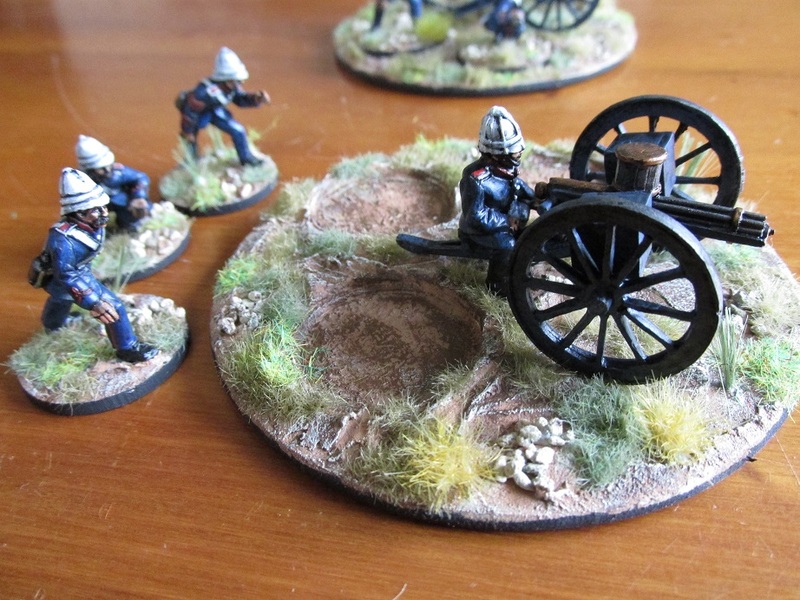 I based this gun team on a 90mm round MDF craft coaster. I kept the figures on their individual bases. I think it works. As far as uniforms go, I have absolutely no reference material so went with pictures of what other people had done – give or take. Over-all I am fairly happy with these guys. 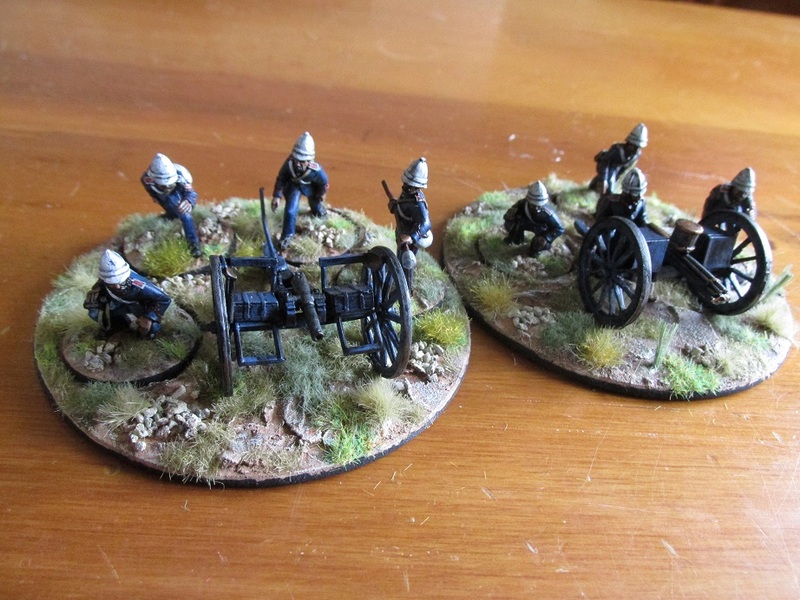 Here is the Empress Miniatures 7Pdr Gun and crew.